Description of Wobbler Syndrome. The definition of Wobbler Syndrome refers to the condition in a dog which appears to seem wobbly when walking or exercising. Wobbler Syndrome describes a dog with generalized failure of muscular coordination and weakness which can affect firstly the rear and then the front legs. Wobbler disease is also found in horses where it is referred to as Wobbler Syndrome. However, in dogs Wobbler Disease is more often used as a description of this condition. When you are worried about your pet dogs or puppies it is wise to make general observations and a note of your dog's general well-being before considering a health issue and problem such as Wobbler Syndrome. Overall physical condition? Mental attitude? Appetite? Condition of bowels and urinary apparatus? The nose of healthy dogs or puppies is moist and cool but in sick dogs it is usually hot and dry. Hair loss? Dry skin? Discharges? These general observations are useful to consider whilst checking out the symptoms of Wobbler Syndrome. The syndrome is caused by a malformation of the vertebrae within the neck which in turn causes pressure on the spinal cord. As the animal gets older, the space within the vertebrae continues to shrink in relation to the size of the spinal cord. This is a serious condition and can progress to complete paralysis. Larger dogs are more susceptible to wobbler syndrome, Great Danes, St Bernard, Weimaraners, Boxers and Dobermanns are more prone to this condition. The syndrome is thought be inherited in dogs. Canine Wobbler Syndrome treatment - Diagnosis should be confirmed by your Vet or Canine health care professional and will include a full physical examination as well as blood and urine tests to rule out any infections or conditions causing similar symptoms. 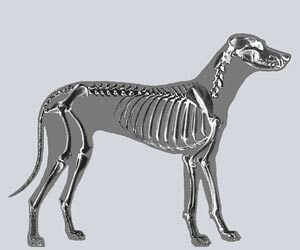 Canine Wobbler Syndrome treatment - X-rays are useful to confirm a diagnosis. Canine Wobbler Syndrome treatment - Treatment for Wobblers Syndrome is dependant on the condition and severity of each individual case but can include pain relievers and anti-inflammatory drugs. Other treatments include the use of a neck brace and even surgery. Pet Insurance for Wobbler Syndrome. Remember canine insurance / pet dogs health insurance for treatment of health and medical problems such as Wobbler Syndrome. Unexpected visits to the vet and veterinary treatments for your dogs and puppies due to illnesses such as Wobbler Syndrome can quickly add up so get quotes for canine health / pet insurance coverage for treatment due to accidents, treatment of illnesses, prescriptions, surgeries and possible hospitalization treatment for your dogs or puppy. Get the best deals for pet insurance from pet insurance comparison websites - make sure you get the best rates for canine health insurance to cover visits to the Vet for the diagnosis and treatment of unexpected ailments such as Wobbler Syndrome. The sole purpose of the Wobbler Syndrome section on the Dog Symptoms and Canine Health website is to act as a reference guide to provide useful information to the owners of dogs and puppies. This article on Wobbler Syndrome is not intended to be used to diagnose or treat sick dogs or as a substitute for obtaining professional veterinary advice. Please remember that if you are in any doubt about your Dog's Health, or problems associated with Wobbler Syndrome, please consult your Canine Veterinary Specialist immediately for professional treatment. Your vet will diagnose whether Wobbler Syndrome is the problem and prescribe appropriate medication and treatment.